Fire extinguishers are a vital life saving fire fighting technology and they should be managed as such. There are many types of fire extinguishers available, 5BC, 10 BC etc… You should be aware of what type you are using and how to clean up the mess. 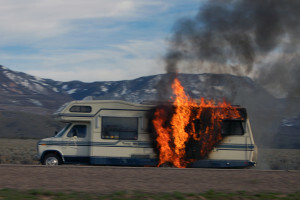 RV Fire Safety is very important for each of us to remember and rehearse how we can prevent fires. Please take a minute and watch the following video. ABDK COLDFIRE Wetting Agent from COLDFIRE SUPERSYSTEM has NEW Hand Held extinguishers that can be refillable by the purchaser. This ultimate hand held extinguisher is used for Class A, B, D, and K fires. The fine spray from the unique nozzle provides user safety if using on a Class C fire. The nozzle also greatly enhances the cooling and soaking characteristics of ColdFire®, and reduces scattering of the burning materials. COLDFIRE SUPERSYSTEM units have been designed to meet most residential, commercial, recreational vehicle and industrial applications. COLDFIRE SUPERSYSTEM HH units are available in 1L, and 2L, sizes. COLDFIRE SUPERSYSTEM is also available in the NEW 1L, 2L 3L & 4L Automatic engine fire system for your diesel pusher. COLDFIRE is a UL and ULC Listed Wetting Agent for Class A & B fires, EPA-SNAP Listed and considered an acceptable substitute for the traditional toxic foams and Halon 1211. More on Cold Fire here.